Meets all FDA requirements for emergency oxygen. Instructional Program was produced for Delta Oxygen by Medic First Aid. Please see our Catalog for a complete selection of system sizes. Order online or call us to place your order by phone. 4 to 9 CF Systems weigh 3 to 5 lbs. and provide uo to 42 minutes of emergency oxygen for breathing or non-breathing victim. Also includes instructional training DVD and CPR mask. 15 and 24 cu.ft. sizes available by phone order. $25 shipping within Continental US. 6 and 9 CF systems weigh 4 to 5 lbs. and provide up to 42 minutes of oxygen to breathing or nonbreathing victim. 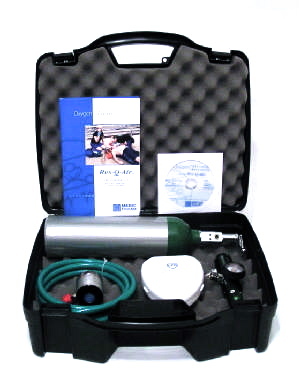 Oxygen cylinder, regulator, waterproof "Hydra-Bag"
This complete portable emergency oxygen system includes 9 cu.ft. cylinder, stainless steel 0 -25 LPM dual DISS port regulator, demand valve accessory package. 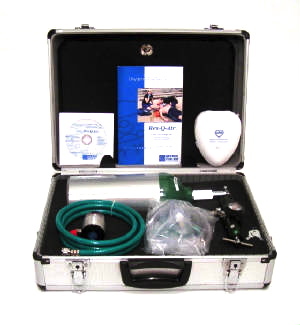 Inlucudes CPR mask, oxygen mask, cannula, DVD training program with certification. Heavy duty water resistant, lockable aluminum case. $35 Shipping within Continental US. 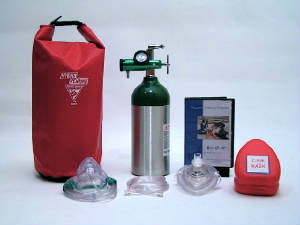 This complete portable emergency oxygen system includes 6 cu.ft. cylinder, stainless steel 0 -25 LPM dual DISS port regulator, demand valve accessory package. 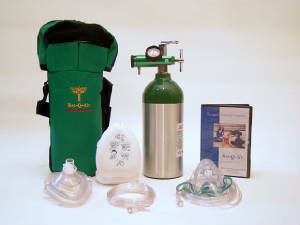 Includes CPR mask, oxygen mask, cannula, DVD training program with certification. Heavy duty water resistant, lockable, shock resistant plastic case. 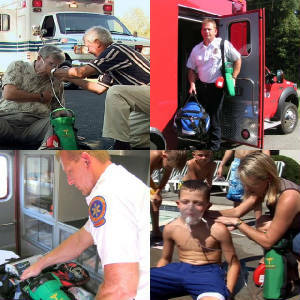 This easy to use "one-touch" portable emergency oxygen system is perfect for home or office use. System includes adult/pediatric CPR mask with 7 ft. hose. Oxygen flow up to 6 LPM emergency setting provides up to 25 minutes of oxygen. Weighs 9 pounds - 20 inches tall. Universal CGA-540 fill port. Wall hook available. $20 Shipping within Continental US.